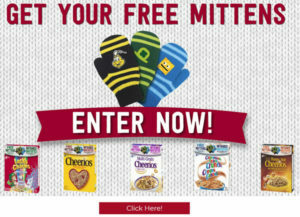 Purchase a box of specially marked General Mills Cereal to get a PIN code for a FREE pair of mittens. There are 3 designs to choose from. Find your pin code on the inside of the cereal box. Enter your pin code and receive your Free Mittens. Maximum four (4) pairs of mittens per household. Up to a maximum 75,000 pairs of mittens available. The offer begins on October 1, 2018, and is available WHILE SUPPLIES LAST or until January 31st, 2019, whichever comes first. It’s telling me the pin code is wrong! And it’s not and my 4 yr old is pretty excited about these mitts. Why is the pin code not working? Make sure you’re entering the correct pin code. I received an error once because I entered an alphabetic “O” instead of a numeric “0”. If it still won’t work send an E-mail using the Feedback form on the website, http://www.lifemadedelicious.ca. This site says promotion ended. The promotion ends January 31/19, today is Jan 11/19. Please honor your printed deadline.